Holyoke, Mass. 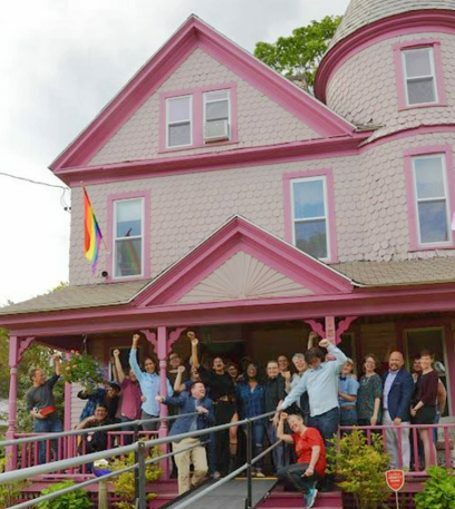 – After a long fight against landlords and banks, June 3 marked a victorious “Welcome Home” to the Sexual Minorities Archive in its new Holyoke, Mass., location. 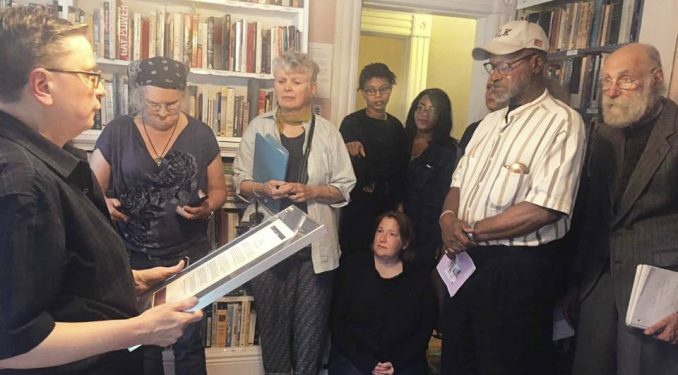 The occasion also celebrated the opening of the Leslie Feinberg Library, housed in the SMA’s new Sylvia Rivera Room. 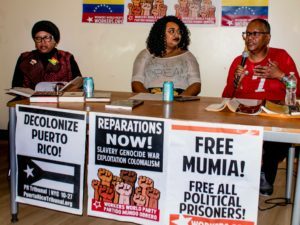 Gathered in the packed house were SMA supporters, community members and activists, including renowned poet and Workers World managing editor Minnie Bruce Pratt, Holyoke Mayor Alex Morse and a delegation from Workers World Party’s Boston branch. SMA Director Ben Power, poet-activist Minnie Bruce Pratt in the Feinberg Library. The SMA is a grassroots collection of LGBTQIA historical books, films, photographs, periodicals, letters and more. Directed by Power, the archive rescues records of queer and trans people’s history and prevents important documents from becoming inaccessible for future research, enjoyment and publication. As the archive’s largest recent addition, the Leslie Feinberg Library is a unique collection of over 1,250 books and pamphlets donated to the SMA by the late author-activist and leading WWP member. 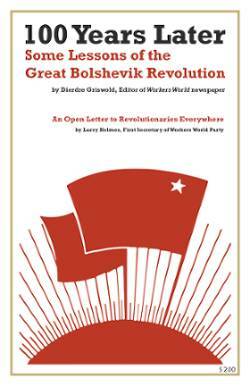 Among them are many items used in Feinberg’s research for the book “Transgender Warriors,” a groundbreaking Marxist-materialist analysis tracing transgender history and delineating the class roots of trans oppression. The room housing this collection is fittingly named in memory of Stonewall combatant Sylvia Rivera, who worked tirelessly to create liberated LGBTQ territory and often faced off against anti-trans evictions and gentrification. Sylvia, along with Stonewall comrade Marsha P. Johnson, founded Street Transvestite Action Revolutionaries (S.T.A.R.) in 1970 and later “Transy House” to support Black and Latinx, working-class, homeless queer and trans youth. Feinberg requested that SMA dedicate hir materials to this revolutionary LGBTQ hero. Power explained that before hir death in 2014, Feinberg offered to donate the library when the SMA was facing eviction — in a gesture of support to generate momentum in the search for a new home. 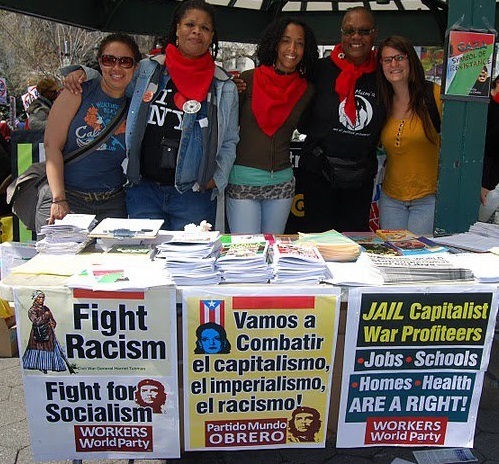 WWP Boston comrades and friends (left to right) Gery Armsby, Diva Williams, Xr. Andie Michelle Burnham, and SMA supporter Er. Andrea’ Voisseau, director of Intersex International. Pratt then read poems that reflected on the life she shared with Feinberg, offering personal and political insights on a treasured figure in the LGBTQ liberation and working-class struggle. Later, a declaration was brought from the city of Holyoke and read aloud by its mayor, welcoming, the SMA and officially making June 3 Sexual Minorities Archives Day. WWP Boston members Frank Neisser and Steve Gillis recalled Boston initiatives that Leslie supported and helped organize, from the historic 1974 Boston March Against Racism, to Leslie’s support for striking students and dining hall workers at Harvard University, to hir role as Boston Pride Grand Marshal in 1998, leading the parade despite the police trying to cancel it. This writer briefly conveyed their appreciation of Sylvia and Leslie’s vision for a world without oppression, and especially recalled their encouragement of young activists, palpable not only in Sylvia and Leslie’s public leadership, but also deeply felt in the way they nurtured, supported and cared about queer youth. Three younger trans-identified candidates and friends of WWP Boston also spoke. Nat Heathman, Christine Allsopp and Mx. 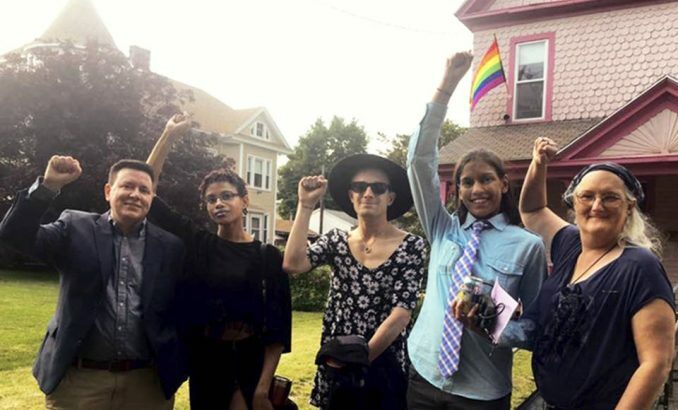 Andie Michelle Burnham shared impressions that Feinberg’s work has made upon them, and the ways in which learning about “trans warriors” who came before both validated and inspired the organizing of this year’s Stonewall Warriors contingent in the Boston Pride Parade, which will march as an “anti-capitalist, anti-racist, trans liberation” contingent on June 10.